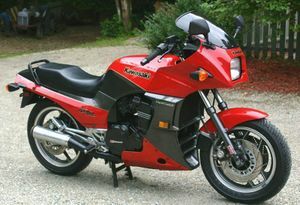 The Kawasaki ZX900A is a motorcycle produced by Kawasaki from 1984 to 1986. It was known in Europe as the GPZ900R. The motorcycle shows in Fall 1983 marked an evolutionary step along the road of ever-increasing power outputs. Conscious of the inroads they had made already, many Japanese manufacturers decided to tone down their efforts. 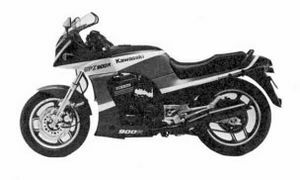 Kawasaki decided to undercut the 1000 and 1100cc machines of its rivals by launching a 900. Nevertheless, its engine marked an important technical turning point. The Ninja proved to be innovative in many respects. Rather than raw power, Kawasaki had sought compact design, with a remarkably narrow engine, with its camshafts driven direct from the end of the crankshaft. It was also remarkably low-built: the frame was reduced to a strong backbone with a bolted-on tubular aluminum rear section and the engine suspended underneath. The machine's aerodynamics benefited from its narrow profile. The Ninja was not the most powerful of the new machines of its day. Its discomfort on the road was only rivaled by its ability on the track. 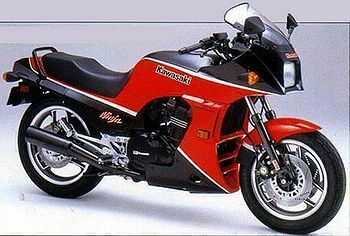 Very fast, yet reasonably priced, the Ninja was a surefire success, so much so that Kawasaki was forced to make a second production run! While its frame design was an evolutionary dead end, the Ninja's new generation engine appeared in several subsequent Kawasaki models. 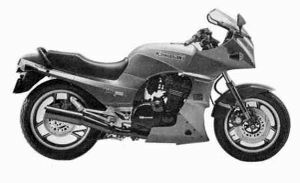 The GPZ900R was a revolutionary design, in that its 908cc liquid cooled 16 valve engine was a first for Kawasaki, and delivered 115 brake horsepower (depending on market). Although its steel frame, 16 inch front and 18 inch rear wheels, air suspension, and anti-dive forks were fairly standard at that time, it took Japanese Superbike performance to a new level. Water cooling and 16 valves allowed additional power, and the frame used the engine as a stressed member for improved handling. It had a top speed of about 155 mph (holding the record for the fastest production bike at the time), and a standing quarter mile time of just 10.55s was recorded by specialist rider Jay "Pee Wee" Gleason. It won the 1984 Isle of Man Production TT at an average speed of 105 mph ridden by Geoff Johnson. 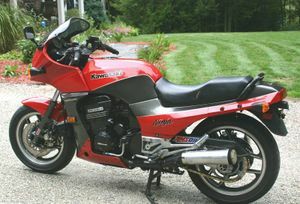 The 1984 GPZ900R was the first Kawasaki bike to be officially marketed (in North America) under the Ninja brand name. Although superseded in the US market within 3 years, the 900R remained popular in Europe and Asia for many years. In 1990 the A7 model saw the deletion of the anti-dive units, front fork diameter increased, and front wheel diameter increased to 17 inches. Although no longer competitive with the cutting-edge sportsbikes of the day it was marketed as a competent sports-tourer. Emissions controls meant that it ceased to be sold in Europe in the late 1990s. Kawasaki ended production for Asian markets in 2003 with the final models being significantly reduced in power due to emissions and noise requirements. Parts Catalog No: 99961-0188 (Microfiche). Remarks: Supersports model with a liquid-cooled, 16-valve, in-line four. AVDS/Anti-dive system equipped and air adjustable front fork, uni-trak system with air and damping force adjustable rear shock absorber, front and rear disc brakes, cast wheels, full fairing. This page was last edited on 24 December 2018, at 16:47.